Happy Sunday/Monday Everyone! Since restarting my weight loss journey last week, this morning I had my first weigh-in. To be honest I wasn't sure which way the scale was going to go. I was on track and counted my calories 3 days last week, so I thought for sure I would have a gain. Well to my total surprise I had a loss of 2.4 pounds! I guess I must have done better then I thought. Yesterday evening prepared some Protein Pancakes to enjoy for a couple days this week. When I woke up this morning, all I had to do was heat up my pancakes along with my turkey bacon in the oven, cook my egg, and preparing Chocolate Protein Fudge Topping! Tomorrow I'm having pancakes again, but with a different topping! Have you ever tried Cottage Cheese with Frozen Fruit? If you haven't I highly suggest you give it a try. I'm personally not a fan of cottage cheese, on it's own, but when I add other things to it or use it in a recipe then it's pretty good. This morning as part of my morning snack I had Cottage Cheese & Frozen Strawberries. Tonigt I took my mom out to dinner, as a late Mother's Day Gift, to The Shadowbrook! I had 1.5 rols with butter, anon 1/2 of a roll I also added on some honey. Dinner tonight I had Grilled Salmon served on a green bean, new potato, cherry tomato salad with a warm tarragon vinaigrette! While my mom enjoyed dessert at the restaurant, I decided enjoy some frozen yougurt. Cake batter frozen yogurt, topped with strawberries, chopped peanuts, oreo cookie crumbs, pb chips, carmal and chocolate sauce! Finally to end today's post, I thought you might all enjoy a few pictures of the scenery from The Shadowbrook Restaurant! Estimated Calories Ate 1790 / Under Calorie Goal by 10! Since I went out tonight I had to just estimate on how much my dinner and dessert were going to be! Progress as of today: 2.4 lbs lost so far, only 147.7 lbs to go! Your food all looks delish....congrats on the wt loss! Congratulations on your loss! Oh my your pictures are delicious! Thank you for sharing your experience. What a beautiful restaurant! food sounds and looks delicious...and is that one of the ways up to the restaurant?? by walking up all those steps!? that is cool!!! Happy weekend and congrats on your loss! Beautiful view! Salmon looks delish! Congrats on the loss! Hello Everyone! I don't know about everyone else, but I'm so ready for the weekend to begin, and it's a holiday weekend YEAH! 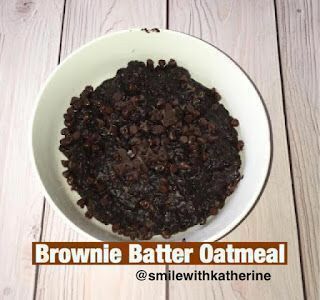 My day started off with some "Brownie Batter Oatmeal" Which I prepared a few servings a couple days ago, so all I had to do is heat it up inthe microwave add on my toppings of choice, chocolate chips, and enjoy! 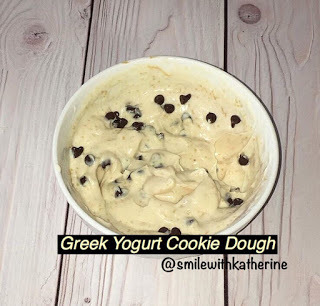 During my morning break after I finished my "Greek Yogurt Cookie Dough" I was still a little bit hungry, so I had 22 almonds, a pack of 2 Oreo Cookies, and yes Idid log the cookies in Myfitnesspal! Lunch today enjoyed "Qunioa Black Bean Bowl" Which I haven't had in quite a while, so I really enjoyed it. About an hour before I went home today, I had to go into the break room to refill my water bottle and I spotted those Oreo Cookies. I told myself "Katherine you already had Oreo cookies this morning" So I walked out of the break room without any snacks. 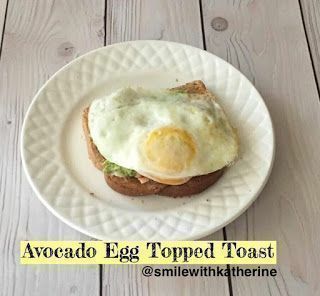 When I got home from work today I was craving both protein and carbs, so I had a pieceof Swiss Cheese and "Avocado Egg Topped Toast"
Dinner tonight I was planning on having a chicken quinoa bowl with veggies, but I had to change it at the last minute because I fnished up the rest of my avocado this afternoon. No worries I came up with something that was pretty darn good if I do say so myself. Instead tonight I enjoyed Oven BBQ Shredded Chicken and veggies on the side, asparagus, red bell better and mushrooms. 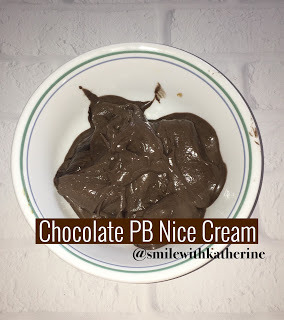 Dessert tonight was "Chocolate PB Nice Cream"
Total Calories Ate 2002 / Over calories by 200! So that pretty much was my day. My goal tomorrow is not to eat any Oreo Cookies, can do it, my frends! Well we shall see tomorrow! Progress as of today: 0 lbs lost so far, only 150.1 lbs to go! Great visuals....will need to be getting some of these recipes!!! 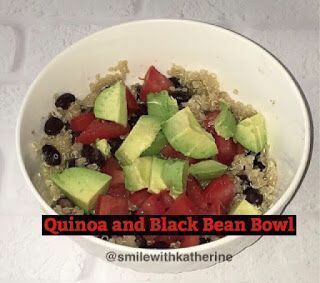 I have noticed the bowls a lot lately.....and I think that beans will make a main ingredient in those a lot....I plan to have plenty of those this summer especially as it gets hotter......great post!!! food choices and menu are right up my ally..! where do you get the recipes?! sounds so tasty! Your starting weight is very close to where I was one year ago. Almost 14 months ago I was at 283 lbs when I decided to start logging everything I ate using an app on my phone. Daily I kept under the calorie count it told me to and it's worked well for me. I like that you are one of those people who takes pictures of their meals as a way of tracking. First, selfishly, because I like looking at the pictures, but also because it seems to me to be a very easy and effective way of being accountable to oneself. I never considered doing that -- not a very techy person although I know how to take cell phone pictures, duh! -- but maybe that's something I could do in the future. June goal for myself? Anyway, thanks for the inspiration! Hope you are doing well today, as well. I need to get back to taking food pics. I was much better at picking the right things when I did that. Hello Everyone! As this is my first entry I wanted to take some time and introuce myself. My name is Katherine and I'm in my mid 40's from the state of California. I'm 5'0 and have over 100+ pounds to lose. My weight loss journey began, again, on Sunday and I'm ready to take this journey on! I plan to document my journey sharing the ups and downs as I travel down the road to better health! Welcome! I find this place to be incredibly supportive, and I hope you do too. It has been very helpful to come here to be accountable without criticism. Welcome! One foot in front of the other. This is the only site that actually seems to work for me. I've lost a lot of weight here. Welcome Katherine....this is a wonderful supportive group....we keep it real....and chat and talk about our ups as well as our downs....I'm looking forward to getting to know you better.